Hello Beatles Fans! 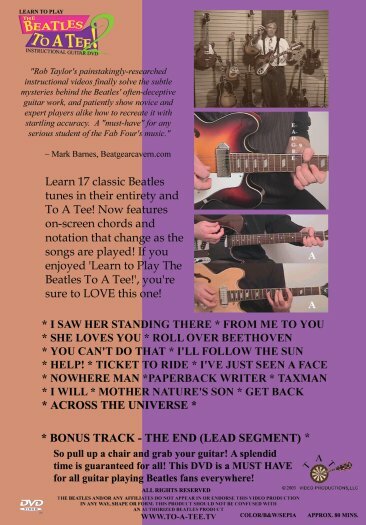 We're very pleased to introduce 'Learn To Play The Beatles To A Tee Volume 2'. This DVD contains the same spectacular split-screen presentation that can be seen in Volume 1 and features 17 classic Beatles tunes! Whether you're an intermediate guitarist or a seasoned pro, this DVD is sure to provide you with a better insight into the guitar-playing styles of John Lennon, Paul McCartney and George Harrison. One new feature that's been added for the benefit of simplifying the task of deciphering the chords visually, is the use of an on-screen chord prompter that changes as the rhythm chord changes occur. This feature allows one to virtually play along with the DVD upon his or her initial viewing! Guitarist Dan Okragly explains his experience: "The chords on the screen make it far easier to get the parts down quickly because you don't have to waste time hitting pause to see exactly what the chord finger position is. Sometimes even rhythm chords can be tough to make out. The chords on the screen confirm it! It's really an ideal feature for this type of DVD." Here, Rob uses the Rickenbacker 12-string during the video's introduction, where he strikes the endlessly debated opening chord of 'A Hard Day's Night'. Other segments, such as leads and riff phrases are shown prior to or immediately following the real-time presentations of the songs. As with Volume 1, the song selection was carefully chosen. Many of these songs, such as `I Saw Her Standing There', `I'll Follow The Sun', 'Ticket To Ride', 'Nowhere Man' and 'Mother Nature's Son' are songs which have remained elusive to millions of guitarists ...UNTIL NOW. We now encourage you to watch and listen for yourself! Visit our DVD CLIPS page to witness several short real-time samples of some of the songs that appear throughout the DVD. Enjoy! The Beatles, Apple Corps and/or any affiliates do not appear in or endorse this video production in any way, shape or form. This product should not be confused with an authorized Beatles product.